The Pulpo a la plancha con romesco (grilled octopus with romesco sauce) at Donostia. “I have some beef cheeks coming right up for you” isn’t a common promise at most area restaurants, but at Los Gatos’ new tapas bar, Donostia, authenticity counts. Donostia is the Basque name for San Sebastian, a Spanish coastal town known for its tapas. The new place is the latest venture of owners Joe Cannistraci and Michael Guerra, the team behind Los Gatos’ wine bar Enoteca La Storia. “We thought Spanish cuisine would be an exciting transition,” says Guerra of the move from Italian to Spanish dining with Donostia. Both men have roots in Italy, a connection that resulted in the creation of Enoteca La Storia. Guerra and Cannistraci were inspired to create Donostia after exploring San Sebastian with friend Jorge Bianchi, who introduced them to Agustin Elbert, the chef responsible for Donostia’s classic San Sebastian cuisine. “This is the authentic Basque experience,” Guerra says. The wave-detailed walls and blue geode piece hanging above the bar call to mind the beauty of the Spanish coast. The extensive tapas menu is matched by the wine and beer choices, which have been carefully selected to pair well with the cuisine. Tapas selections include Bonito tuna belly pierced with a toothpick alongside an anchovy, a guindilla, an onion and an olive; and carrilleras en salsa (slow-cooked beef cheeks). The beverage selection boasts Txakoli, the Basque country’s famous dry, slightly sparkling wine; Isastegi cider, a refreshing palate cleanser; a variety of Spanish wines selected by Guerro and beers chosen by resident beer specialist Ryan Smith. 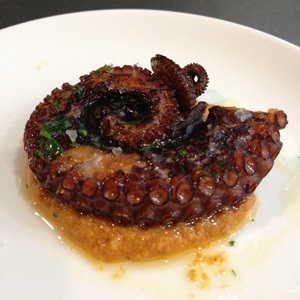 Donostia is located just three doors down from Enoteca La Storia. The restaurant is open 3-10pm, Sunday and Monday; 3-11pm, Tuesday and Wednesday; 3pm-midnight, Thursday-Saturday. Find more Los Gatos dining options with the LosGatos.com featured restaurants list.